As the Joker's partner-in-crime, you're always up for a prank! This Costume Includes a dress, headband and Mask. This is an officially licensed DC Comics Harley Quinn Costume. Dress up like your favorite Harley Quinn and become Joker's sidekick for his evil motives. Harley Quinn is funny sometimes and evil most of the times with a strong affection for Joker. Harley Quinn is in Gotham City tonight so just beware from her evil motives. Memories are always kept for lifelong time and special ocassions come for capturing these memories. Let her enjoy a fang-tastic Halloween eve with her friends in this freaky costume. 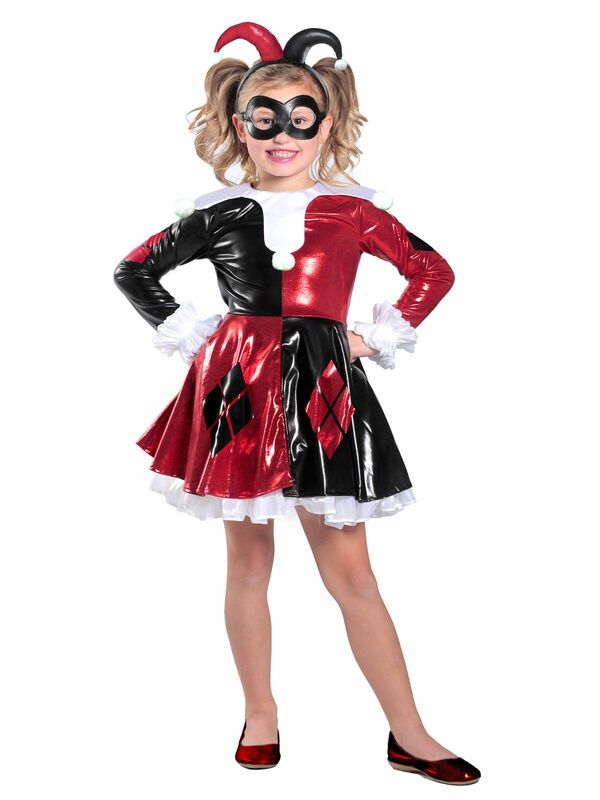 Bring more smiles and sparkles in eyes with Harley Quinn Premium Child Dress costume.